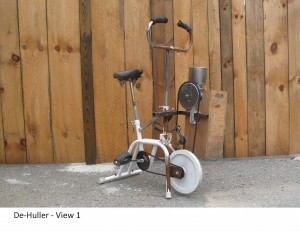 In 2014 Bill Braun asked me to build human powered machines for threshing, cleaning, and de-hulling grains and beans. The first prototypes show potential; for a cost in materials of under $896 the time required to thresh and winnow 100lbs of dry beans was under 15 minutes of easy work (approx 30-100 watts of human power). The machines also work well on rice, and are adaptable to a variety of grains and seeds. Their advantages are: 1.Low initial cost. 2. Safe, low-noise, no fuel, no pollution. 3.Machines can be adapted to different crops easily and quickly. 4. Gentle aerobic exercise is good for the farmer’s health and can prevent other injuries and chronic conditions. 5. Fun and safe for customers and their children to use—saves on farm labor. Although I built successful prototypes of three machines, a significant amount of work remains to be done before the designs are ready to share with others. This year I seek the funding to complete the project and document the plans for do-it-yourself farmers and fabricators. The work that remains to be done is: 1. Improve the performance of the machines. 2. lower the cost of materials to ~$600. 3. build a fourth machine for seed fractionating. 4. 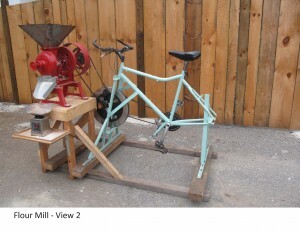 Include plans for converting a flour mill to bike power. 5. Make 3-d computer models and construction plans and upload them to the web for free. 5. Make a construction and operation video to accompany the plans. 3-10 acre vegetable farms have the equipment to plant grains and dry beans, but not the equipment to harvest and process them for market, seed saving, or selling seed. Available commercial equipment is designed for large farms and either costs too much and/or only works on one crop. There is one gasoline powered 5hp combine available (for about $5,000). Both my brother, and one other farmer I spoke with, found it difficult to use, difficult to adjust and tune for different crops, and lacks stateside customer support. A small commercially available seed cleaner (The Office Clipper) costs over $2,000. Many CSAs offer a winter share, which includes greens, root crops, winter squash, and stored items like onions and garlic. They want to offer grain and dry beans but either the hand labor is too great or they can’t afford the machines. Grains and dry beans are easy to grow, don’t require a lot of pesticides or herbicides, don’t require large labor inputs in July and August, and keep well. They are just small and take too much time to process by hand. I built a suite of three micro (~1lb per minute) scale machines for threshing, winnowing, and de-hulling seeds. They all require 30-100 watts of human power (for comparison a person bicycling at 12 mph on flat ground is using about 90 watts). They present the small farm with several different possible uses: 1. Processing grain and beans for selling. 2. Processing grain and beans for eating or bartering 3. Processing grain and beans for saving and planting (eg: cover crops) 4. Processing seeds for selling seed. The machines are made from simple locally available materials (examples: wood, screen, bicycle parts, and fasteners from a hardware store). They can be made with simple tools (examples: a skillsaw, a drill, a stapler, angle grinder, bicycle tools, and either a wire feed welder or a oxy-acetylene welder). The machines are highly adaptable to the specific use a farm will put them to, allowing them to be used for several different crops. My objective is to increase the performance of the machines, lower their cost, simplify them for the do-it-yourself builder, and make the plans and supporting video available for free on the web. 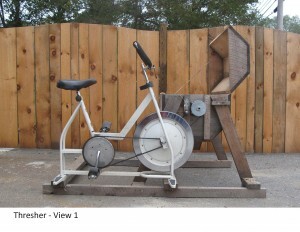 The choice of bicycle power for the Grain Bikes is not merely fanciful. In addition to the health and safety benefits of cycling, bicycle power forces the design of an energy efficient machine. If the farmer wants, they can substitute and electric motor for a cyclist with the confidence that the motor size and electricity consumption are as small as possible. First the thresher: The thresher operates by beating the material with a rotating set of flails. The flails attach to a rotating shaft. The thresher can operate as a batch-fed or pass-though process. Now, the design of the thresher can be modified to make construction simpler and the materials less expensive. Also, so far I have three different flail designs for different crops. In the final prototypes I will make and test more flails and a faster way of changing the flails on the shaft. For example, it should be easy to make flails that work well on sunflowers. Changing from one set of flails to another (for example, from the flails for beans to the flails for wheat) should take two minutes. Second the Fan Mill/Winnower: This machine operates by gently shaking the threshed material on an inclined screen (scalping screen) that separates large from small pieces. The pieces that fall through the scalping screen (the crop seed) land on a second, finer screen that sends the crop seed to a winnowing tower while allowing smaller debris (dirt,dust, frass) to fall out on the ground. The winnowing tower separates the (heavy) crop seed from the (light) chaff by blowing air upward against the falling material. The machine outputs finished crop seed in one chute, large debris (unthreshed seed heads, extra large bean seeds, or pebbles) in a second chute, dirt on the ground, and chaff out the stack. This is by far the trickiest of the three machines to design. It easily achieves the 1#/minute performance goal, but has trouble winnowing small seeds, and is too tall and awkward to use conveniently. 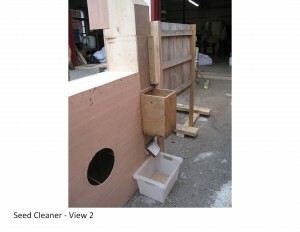 The next prototype will make the machine lower and easy for one person to operate. I want to experiment with adjustable turbulators to improve the separation achieved by the winnowing tower. It will be simpler to build. I will improve the sensitivity of the blower for lighter smaller seeds by adding gears to the blower transmission. I currently have 8 different screens. I will research and acquire a finer variation in screen sizes to differentiate certain crops. 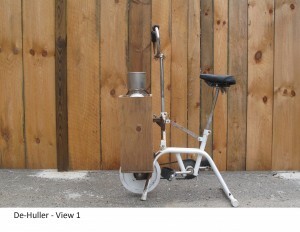 Third, the de-huller: The de-huller works by rubbing hulled seeds between to rubber pads. It is made from a flour mill with the burrs removed and replaced by USDA certified food grade latex pads. The original prototype is made from a cheap, $32.95 flour mill. This adequately proved the concept works. I would like to build a second prototype using a slightly higher quality mill with a better geometry for dehulling. Also, the latex pads need to be glued with a better glue, so I will make a series of tests to see what glue and gluing process works best. So far I have only tested the de-huller on rice. It needs to be tested on other crops, like oats and barley, so getting the feedstock seed and running the tests needs to be done. 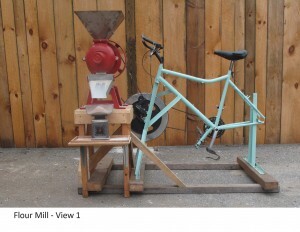 Fourth, the mill: Milling grain into flour with bicycle power is already well investigated on the web. My method for doing this makes the following improvements: 1. The operator faces the mill so they can see what they are doing. 2. 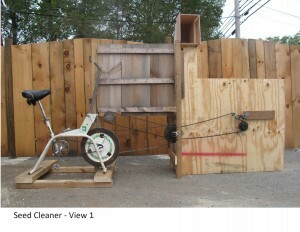 The bike unit has a large flywheel for smoothing out the operation of the mill. 3. The bike unit has gears. Gears are important since flour milling is by far the largest power requirement (at 1#/minute, the power required is something like 150 watts, more than the average cyclist can produce continuously). I’m happy with this machine as it now operates. All there is to do is document the plans and variations and include it in the video. The bike power unit is also a model for how to make a bike into a single bike power station that can power several different tools. Fifth, the seed fractionator: A seed fractionator operates by subjecting seed to a tortuous air stream of finely adjustable speed. The seed sample is separated into light seed and heavy seed. The fractionation can be done several times to subdivide a sample into more parts. Germination tests performed on each sample allow the seed seller to certify the germination rate. This is necessary if the farm is growing seed under contract to a seed company. There is already a DIY design for this tool, powered by an electric shop vac, but no step by step plans. All I intend to do is copy this device, test and refine it if necessary, and then make the plans for it. It will be powered by electricity, not human power. Plans: Emily Vogler (my wife) will make models of the machines in Rhino, a 3-D modeling program, while I guide her through the construction process. Then she uses images and layers of the models and copy that I provide to make presentable 2-D instructions. We did this with the bicycle powered root washer and it worked well; I understand what details are important to the operation of the machines, while Emily understands what other people will need explained to them. We have discussed the Grain Bike plans already. One idea she has is to separate the woodworking, metal working, and bicycle repair aspects of the construction plans so a farmer/builder could hire a specialist for any part they can’t do themselves. Video: Olaf Bertram-Nothnagel will make video of the machines working, and the construction details and processes. Olaf edits video to provide the most information in the least time. 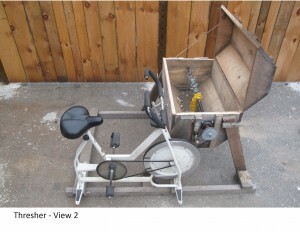 His short video of the first prototypes of the grain bikes is at: https://www.youtube.com/watch?v=Lgnmhtbgyfg . Construction and testing of the next generation of prototypes will occur between 2/15/2016 and 6/30/2016. Emily and I will prepare a posting for Farmhack (www.farmhack.org) that describes the machines, how they work, how much they cost to build, and what tools and skills are required to construct them. That way farms interested can plan to plant crops in the Spring they may use the machines to process the following Fall and Winter. The posting, uploaded 3/2016 will promise complete plans by the end of October, 2016. Between 3/2016 and 8/2016, Emily and I will make the 3-D models and produce the instructions. Also between 3/2016 and 8/2016 Olaf will shoot video of the machines under construction, and in operation. Once the instructions are complete Olaf will use them to edit video so that the details covered in the instructions are supported by the video content. The plans and accompanying video links will be uploaded to Farmhack (www.farmhack.org). The target date is 10/31/2016. The plans will be free for anyone to download and print. Emily will print booklets of the plans to hand out at conferences and events. I will be available by email to answer questions for free.